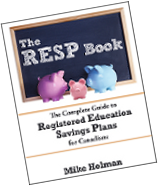 One of the drawbacks of opening up an RESP account to save for your child’s post-secondary education is that if the child ends up not attending post-secondary education or quits early, then there are some penalties applied when the RESP account is collapsed. Any RESP grants paid into the account are removed and sent back to the government. You can withdraw all your original RESP contributions without any taxation or penalties. Anything left in the account is taxed at your marginal tax rate plus 20%. This part of the withdrawal is called the Accumulated Income Payment (AIP). All you have to do is contribute the accumulated income amount to your RRSP or your spouse’s RRSP. By doing this, you can avoid the 20% extra penalty and you will defer any income taxes that would have been due on the payment. Payment has to be make to only one subscriber of the plan. Plan has been open for at least 10 years and each individual who is or was a beneficiary, is over 21 years of age and not eligible for an educational assistance payment (EAP). No problem, contribute the AIP amount to the RRSP, wait until the following year and then withdraw the same amount from your RRSP. Assuming your marginal tax rate is unchanged between the time of the contribution and withdrawal then the amount of income tax paid will be the same as if you hadn’t contributed the AIP to the RRSP in the first place. And there is no 20% penalty! What if my spouse and I don’t have any RRSP contribution room? Good problem to have!. Assuming you are still working then you can just wait to collapse the RESP until the following year. Reduce your RRSP contributions appropriately so that you will have enough room next year to contribute the accumulated income portion of the RESP. In this case you are really only saving the 20% penalty since you are reducing your normal RRSP contribution by an amount equal to the AIP, but saving 20% is still very worthwhile. Unfortunately, if you are too old to make rrsp contributions, then this plan won’t work. My son just quit University after one year and there is still money in the RESP – do I have to pay a penalty to withdraw? If you collapse the RESP account then the penalties and taxes will have to be paid. However, the 2008 budget allowed for EAP withdrawals up to 6 months after the child stops going to school. EAP withdrawals are when you withdraw the accumulated income from the RESP. These will be taxed in the hands of the student and won’t incur any penalties. If you are in that situation then just empty the account out as soon as possible. This strategy can only be used if the student starts post-secondary education. Budget 2008 introduced a six-month grace period for receiving an EAP to provide more flexibility for a beneficiary to access RESP savings. Under this measure, an RESP beneficiary is eligible to receive an EAP for up to six months after ceasing to be enrolled in a qualifying program, provided that the beneficiary would have qualified while still enrolled. 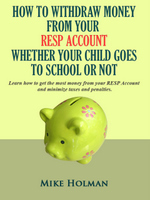 Check out my RESP rules guide for more information on RESP rules and how to set up an RESP account. I also think there is a $50,000 limit on the amount you can transfer to RRSP’s. Hard to reach that much in earnings considering the contribution limits, but if you invest early and have some good results, it’s possible to get there. I was wondering why anyone would put more than $36,000 in the RESP account, as this is the amount when the gov’t stops giving you the grant. A TFSA (if available) would be a much better savings vehicle after that point. Scott – thanks for mentioning the $50k limit. I doubt it would affect very many people, but you never know! As for why would anyone contribute more than $36k – you have to remember that the TFSA is very new. Before the TFSA came along then the ability to overcontribute to an RESP was fairly valuable since it was tax-sheltered. Even now, for someone who maxes out their TFSA room already and is looking for more tax-sheltered room, over-contributing to an RESP can make sense if it is done early on. Maybe my return expectations are high + I will be planning on contributing the full $50k, but I’d expect a sizeable amount of ‘anything left in the account’. Over twenty years, I do project having over $100k in the account by the time our child is ready to go to school. I wonder if this means parents in this situation should halt RRSP contributions during those years leading up to the kid going to school as a ‘just in case’. My only problem with this concept ‘avoiding’ penalties is that if you transfer the monies to the RRSP, you essentially forgo the tax deductibility of that contribution – therefore everything equals out and the govt gets their money. So if you are at 40% tax rate, you are essentially come out even (i.e. you don’t get deduction on the rrsp contribution but save on the tax you would pay on the RESP closing). Maybe a good plan would be to take a sabbatical in anticipation of your kid not going to school? Sampson – The only penalty you can easily avoid is the 20% extra tax which is the point of the article. As for the income tax hit – once the money is in the rrsp then you can perhaps manage things to lower the tax hit – maybe by taking a “sabbatical” as you suggest. I love your suggestion of halting RRSP contributions for a few years leading up to the years when the kid goes to school. I would modify it however to wait until the kid decides not to go to school and then reduce the RRSP contributions. You can keep the RESP money in the RESP account for a long time (35 years) so there is no rush to collapse it. For someone with a large RESP account, the 20% penalty tax can be quite a bit. If your account is $100k and you want to collapse it then you will give the grants back ($7,200), the contributions will be tax-free (let’s say $40k) so the AIP will be $52,800. Only $50k can be moved to the RRSP but 20% tax saved is $10,000! This 20% tax would be a killer for someone with a sizeable pension plan. I assume that the left over ($50k) can be moved in either parent’s accounts. Maybe there is a case for aunt’s/uncles, grandparents to set up RESPs to spread the money around if the child does not go to school. This might be a mute point since I’m guessing the vast majority of kids these days go through some sort of post-secondary education, and the RESPs seem quite flexible on what is considered education. A large pension plan would make this strategy difficult. For most people, it shouldn’t be a problem to just move the AIP to their RRSP since most Canucks don’t max their RRSP. I’m trying to use up my rrsp contribution room but even after contributing $30k last year I still have $40k of unused room. This is a problem I won’t have to worry about until 34 years from now. I do have a question though. What if you have a family plan and one kid goes and the other doesn’t? Can you just get the one child going to withdraw everything? Here’s the other idea I had. I did not go to college until well after I had dropped out of high school. Even kids that initially choose not to go to school of some kind my change their mind after holding a number of menial jobs for a while. What often happens in my experience is that even minimum wage seems like a ton of money when you are living in your parents’ home not paying any expenses. Once you move out and start paying rent and food and car and car insurance and a bunch of other crap; that’s when you realize how expensive just your base cost of living is. Add a girlfriend/boyfriend or a child and you just can’t make it. I’m just guessing here but at that point if the money is still there an option to go for higher education becomes a lot more attractive. Anyone else on this? Rachelle – If you have a family plan or even if you have two individual plans you can easily transfer RESP money from one sibling to another without penalty. The only limit you have to worry about in that case is the $7,200 lifetime grant limit. If the money being transferred includes enough grants to put the recipient over the $7,200 limit then they have to be returned to the government. That’s a good point about the RESP being a good motivation to return to school. If I remember there was a rule that the RESP add to be in existence for 10 yrs before you were allowed to switch money to your RRSP when canceling the plan. @JF – you are absolutely right. I meant to put in the qualification rules for transferring to an RRSP but I forgot. Is there is a limit to how much one can withdrawal from an RESP once the beneficiary starts post secondary education. Let’s take an extreme example. Say you really managed to do well performance wise, and your contributions, grants, and returns have totalled $300K. You have one child and they intend on staying at home while completing a four year degree. Assuming that total education needs are reasonable, say under $15,000 per year, are you allowed to take out more as you know you aren’t going to exhause the $300K? Can you take out $75,000 per year? I’ve read that you have to have documentation supporting your requirements when you go to your bank/financial institution when you first start taking out RESP money. for most financial institutions you just have to provide proof of enrollment at a qualified post secondary institution, then you can take out as much as you want of the contributions. For the first 6 months you are limited to the amount of grant you can withdraw. We don’t need to see the receipts for books, residence etc. Heck, you can use the money to buy your kid a car if you want (in order to get to school of course!) However, there are other organizations that run RESPs (i.e. Canadian Scholarship Trust Foundation) that may have different requirements. My son wants to get his commercial pilot licence and will start with the recreational licence. I want to find out if I can use the RESP money for this and if there is a list of qualified educational institutes. My bank is not of any help. Hi Laura – this link contains information about qualified institutions. Even if the school is not on the list, I suggest giving them a call to make sure it’s not eligible or to see if it can be added to the list. My RESP account has been in existance for over 10 years. I have 2 daughters aged 22 & 19. Both have decided not to attend college or university. My 19 year old has moved out and is engaged. Can I collaspe my RESP plan. I have RSP contribution room in my account and my wifes account that should take care of about 90% of the monies in the RESP. Extenuating circumstances include I have stage 3 cancer and need the funds for expenses. So my son has just quit school for about half a year now, but his program or course of choice requires him to participate in both term 1 and 2 to recieve a grade. Quitting halfway made him lose his grade and causing his transcript to have W(s). My question is, how can my child still recieve the 3rd Resp fund if he quit his previous university, but is now attending school in fall? By not having a complete transcript disallowed him to recieve future funds? @Gordon – Is the RESP a group or pooled RESP fund? Or self-directed (ie at a bank or with a financial advisor). My son did not use a portion of his RESP that I provided for him. Could his Resp be transfered to me, to pay for my adult education program? 1) A limit per plan (i.e. Family Plan or Individual (non-family) Plan) limit. For example, you have one Family Plan with 3 children in it, then you are allowed to transfer up to $50K. If you have 3 children, each with a Individual plan, you could transfer up to $50K for each plan, for a max total of $150K. 2) A limit per child. It does not matter if what type of plan you have, you can transfer up to $50K for each child. If you have 3 children, that would be a max total of $150K. 3) A limit per subscriber. You can transfer up to $50K, no matter which plan you have or how many children are in them. The answer is number 3. Each person has a lifetime limit of $50k of RESP earnings which they can transfer to an RRSP. OK. Thanks for the feedback Mike. I can see this being a issue with Family Plans that have 3 or more kids in them who contribute 2K (or more) /child /year and get decent returns on their investments. With just 3 kids, after 10 years (of contributions for each kid) you will have invested $60K and if none of them go to school, you are probably going to end up with more then $50K in the RESP after deducting the Contributions & Grants. Especially if you are allowed to keep the account open for up to 35 years. That being said, I would hope at least one of them would go to post-secondary education and you could drain the account that way. I assume you would have to give back the grant money for the kids that did not go to post-secondary education but the accumulated income that grant money generated could be used by the one that went on to post-secondary education? @Steve – Yes, that limit is certainly biased against families who have more kids. Whether they are in family or individual plans doesn’t affect the $50k limit. As for your question – yes, you could direct all the money in a family RESP to one beneficiary. Any grants in excess of $7200 would be returned to the gov’t. The problem of course, is if the oldest goes to school, but the (much) younger kids don’t. By the time you realize the younger ones aren’t going to school, it might be too late. My question for you Mike is this how much of the grant money would my son loss if the total resp is just under 3ooo and he isw not going to post secondary school and he is only eighteen. @Francis – I would go with the bank RESP. “But I need the money! Why do you have to wait until the following year? Normally, I agree, contributing and withdrawing from an RRSP in the same year doesn’t make a lot of sense, it just burns up RRSP contribution room. But here it has the advantage of saving 20%. I’m sure I’m missing something. Tell me, please! Please take another look at the provisions. The way I read it is that the subscriber must have RRSP contribution room, in which case he can contribute to his own RRSP, or an RRSP of his spouse. I ran into that gotcha’ just last year when the spouse had plenty of contribution room, but it didn’t help for averaging *my* income. Does the bank still withhold 20% even if the AIP is transferred to your RRSP? If so, where do they get the money from, the AIP, or some other account? Thanks for an educational page. In the first question above, I meant contribute the AIP to an RRSP, then withdraw money from a different RRSP in the same year. And if you really need the money from an RRSP, can’t you withdraw it, and then wait until the next year to collapse the RESP? In other words, what you said, but in the opposite order. I don’t know if this thread is still open but, just in case…. The only information I can find online is what happens if your child doesn’t go to school. What happens if your child does go to school but you don’t use the RESP to pay for it? My ex husband says the money, which he refused to use to pay for our son’s university, can be rolled into an RRSP for him but I’ve also heard that this cannot be done (and in fact is a form of fraud??). Can the money be rolled into an RSP if its not used for education even if the beneficiary does, in fact, go to university? @Catherine – Yes, it can. As one of the perplexed, I appreciate this guide very much. Family plan with 3 beneficiaries. Two beneficiaries did school, one dropped out and is not going back. Say we contributed, as allowed, $50K per kid. Plan worth $150K+…but dividing between the two eligible children means contributions were then effectively $75K per actual beneficiary. Is this trouble? (keeping RESP open not an option – needs to be closed out). Hi Jennifer. No, that’s not a problem. You might have to give some grants back as explained in point #6 of this article: http://www.moneysmartsblog.com/withdrawing-money-resp-account/, but there isn’t anything you can do about that. I have been a resident of Canada for 5 years and started RESP for my kids. After contributing to RESP for 2 years, moved to USA & not sure if i will be returning back to Canada. I am filing taxes in Canada as a non-resident. I am not sure what to do with RESP contribution. Pl. advise. If i continue the contribution, will i be eligible to withdraw although i am a non-resident? 1-when you say you can contribute up to 50k to the RESP (if you have contn room), are you also saying that it is deductible against income, as a normal contribution would be. I have a unique situation. My son wants to go away to a program for 1 year. His father and I are divorced and his father does not want to pay for him to go away for school. Can I withdraw the money for my son or do I need his father to sign off on the withdrawal? @Catherine – It depends on who is in control of the account. If both of you are the subscribers on the account, then both of you have to agree to do the withdrawal. However, given that this is a divorce situation, there could be legal considerations which might need a lawyer to figure out to see if you can withdraw money on your own. my Mum had established an RESP when she was alive. The intent was to fund her grandchildren’s educational needs. She has now passed away (Feb, 2007) and my Dad is administering the RESP. We would like to use the funds for school fees in the UK. Is the grant money affected if the student gets a scholarship. My son decided not to attend school after RESP had been accessed to pay tuition. Now school has reimbursed him in full. How do I return this money into his RESP for later use without penalty? I understand that the 50K limit of transferring RESP income to an RRSP applies per subscriber. If you have one family plan and both parents are joint subscribers to the family plan, can 100K be transferred to the RRSP’s (50K for each subscriber of the one family plan?) Or can only one of the subscribers make use of the transfer? If so, then this would be an argument against family plans vs individual plans. I contributed into RESP for a few years, but then had to withdraw all my contributions (was some emergency case). Now i want restore my contributions. What happens to lifetime contribution room. Can I contribute again up to 50k? if there are 3 siblings named in the resp ages 20, 17 and 6. can it still be collapsed and turned into an rrsp? Have received an inquiry from a Canadian friend who has retired outside of Canada. He wants to know how can he access any remaining contributions made in his Registered Education Savings Plan that he set up for his daughter’s education. She only used a portion of this before leaving school more than a year ago. He is 70 years old. I just started contributions for my son’s RESP and fully intend on reaching at least $36,000 worth of contributions and receive the full $7,200 worth of grants. For argument sake, if my son decides to go into the trades and only uses $18,000 , do I still get to use the full $7,200 for EAP withdrawals, or would I be penalized at the end of the 3 years because he only used half of the fund. out, but, I don’t need it for school. I’m lucky enough to have my dad work at the university I am attending, so my tuition is waved in this case. I was going to split the money between selected div paying securities , and a robo-adviser account I have. I am also working, so I don’t need quick access to the money, I realize the risk associated with this. I under the impression that if i move this money from “A-B” then i will have to realize this as income come tax season. Is this true? If so, how can i avoid this, still fulling my plan with money. Sorry for the novel, thank-you for reading. Next post: Should Financial Advisors Disclose Their Commissions?